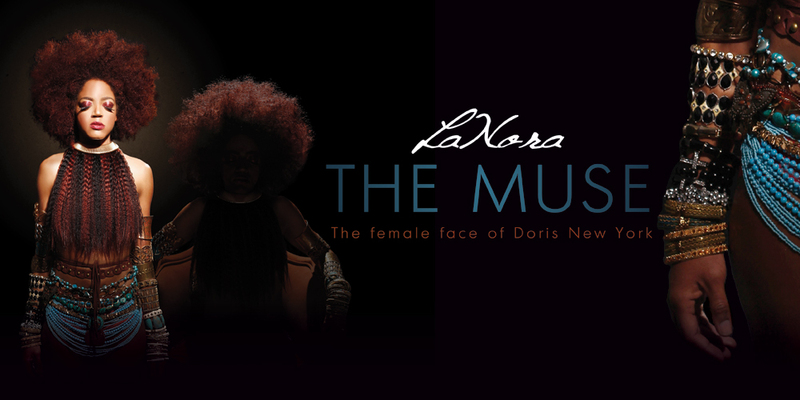 LaNora The Muse : Doris New York, Illuminate Your Star! I am a Storyteller, blessed with the gift of gab and a talent for the written word. I search for the unimagined and make you can’t imagine life without it. I outline, execute, and deliver a sellable creation. I take the necessary business steps to sell original creations. I see the future, I embody the past, I live in the present. I am an entrepreneur, I am a hustler. I am my source of income, I use all of my skills and talents to fund my dreams. I am of the female persuasion. I am blessed with two beautiful daughters, Ryan Alexis and Riley Alexa. I am a sister, of the brown skin type and the third sister in family of five plus a brother, also a brother. “I need this.” ...Those three words sealed the deal on what was soon to reveal itself as my purpose. After responding to a Doris New York FB call for photos of women with big afros, I was contacted by Marlene Duperley to send in a straight on shot. I responded “...not really a stare in the camera kind of girl...working on it” and sent in two photos with my eyes to the side but visible. A month later, I was invited to the casting call. Just 2 and half months after first arriving in Harlem, I took my 5 and a half month old daughter in her sling and we were off to Brooklyn to book mom a hair gig. After a three year roller coaster ride complete with 2 babies, a career change, a new business, and a nervous breakdown, I knew I was due for some motivating news. Besides, if it was big ‘fros she needed, I definitely fit the bill. Well, fate would have it that Marlene was exactly what I needed to lift my spirits in preparation for the work to come. Not knowing what to expect, I arrive at the casting call and I am instantly reassured by the energy in this beautiful Brooklyn loft and the overwhelmingly stunning Marlene. The warmth that she exuded and the fact that she had her 3-year-old son there with her as she worked, immediately put me at ease about bringing my baby to “work”. I remember one of my most trusted advisors, Marcella Jones, told me that when you are building a business and raising a family at the same time, people are going to have to understand that there will be times when the two will overlap. In true Marlene fashion, her hands instantly gravitated toward my hair as she surveyed the ‘froscape. Like a fortune teller with palms, she quickly read my hair, gave me some products and instructions, and let me know that she would be making casting decisions by the next day. She later told me that she had plans to use me, but it was my subtle plea at the end that let her know that I had to be a part of the photoshoot. I showed up to the photoshoot ready to work. I had met the photographer, Brian Luvar, at the casting and he assured me that he would work with me once I informed him about my sensitivity to light and resultant eye mobility issues. The Diva was the real star, so I just focused on not staring straight into the camera and really following Brian’s direction. I believe he sensed my need to take it slow on the facing forward front, so he guided my eyes to where they were both comfortable and where he could get his shot. A week or so later, I receive the mock Doris New York girls ad and that little girl in me felt like the Supershero I portrayed in that picture. Looking into the horizon. That was more than enough to satisfy that aching to see a visual manifestation of what I knew to be true inside. “I was made for this.” And by this, I meant New York, following my dreams, becoming a writer, a storyteller. Of course, when The Diva got a call from Marlene saying the DNY girls had been invited to read for a part in the Black Girls Rock trailer I started to suspect this moment would last a bit longer than expected. Then came product modeling for DNY at Circle of Sisters and for Sofistafunk at their trunk show. That part was much easier. I am a people person, I love meeting new people, hearing new stories, touching new spirits and being enriched for the experience. Having hair, make-up, and styling in the most beautiful skirts ever was just the icing on the cake. By the time Marlene was casting for her next campaign, we were all DNY family and I was determined not to overthink the shoot. My favorite make-up designer, Shameika Bowman, who got to know me and my eyes on the first shoot was there, Sofistafunk was there, Marlene and Brian were there, I was safe to push myself a little further this time. I needed a lot less direction and I made a point to look straight to camera a lot more. The next day I received a call from Marlene saying that I “rocked the shoot” and that they wanted to shoot a Winter campaign featuring me. I couldn’t believe it, I was truly overwhelmed. The team is always telling me that I am doing a great job but we are all family now, I know that I am working hard but I always think that they are just being nice.